Holy Wow! This was good. It’s definitely something I have to make again. I don’t like salmon. I always found it to be too fishy for my taste. But one day as I strolled through Whole Foods. I saw wild-caught salmon was on sale and looked so fresh. I think it had just come in. They had a sample table and once I tried it, I was hooked. I wanted to ask for more but didn’t want to look crazy so I just got one for the baby and my hubby. I had to try to make this so I asked the lady at the table how she did it as I asked the guy behind the glass for 2 lbs of fish. She said that the salmon was marinated and then put on a wooden plank for the smoky flavor. A-MAZ-ING! She told me what the basic ingredients were so I got an idea of what I wanted to do with it. I made it the next evening, after soaking the wooden planks over night, and we were all licking our fingers. My one-year-old asked for more. So I had to give her some of mine. When it’s good food, I never mind giving it to her. I have always hated salmon’s flavor and texture but when purchased and cooked just right, it can taste incredible. I must have had not so fresh and probably farm-raised fish before which is why I didn’t really like it. Marinate the fish in an air-tight bowl for at least 5 hours with apple juice, rosemary, and syrup. As you marinate the fish, soak the planks. 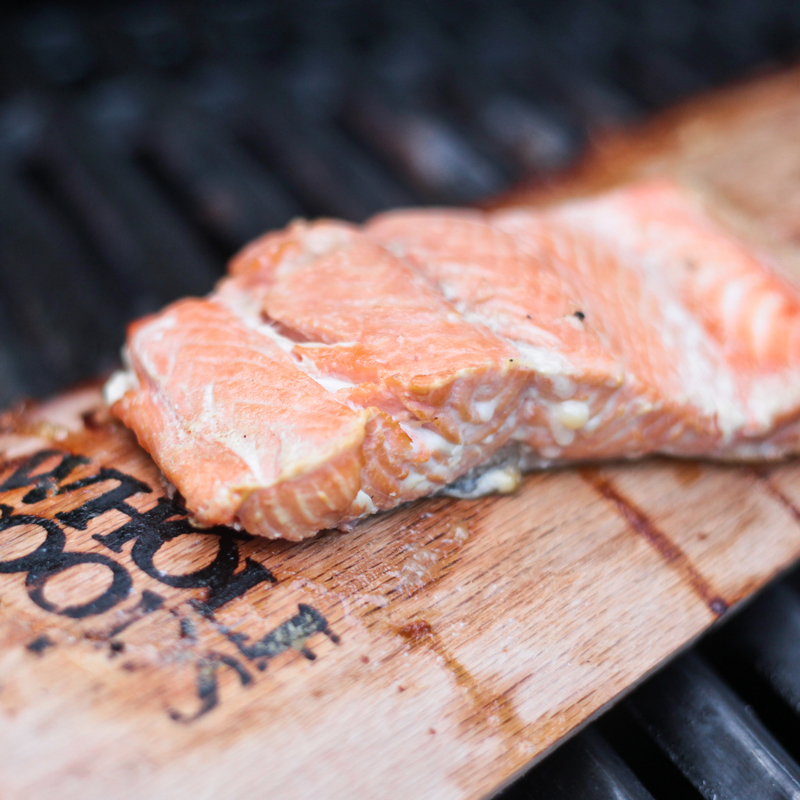 Preheat grill to 350˚ and place fish on the plank in the grill. Add salt to taste. Cook for about 20 minutes, turning it over after 10 minutes. Watch to ensure that the plank is not catching fire. Mine did. If that happens spray the wood with a water bottle. Once the edges of the salmon are browned and texture is flaky, it’s done. Serve with quinoa, greens, or sweet potatoes and you’re good to go. Enjoy!